This week's five AHAs are from the AHAbook™ Jane Austen’s Sense and Sensibility. 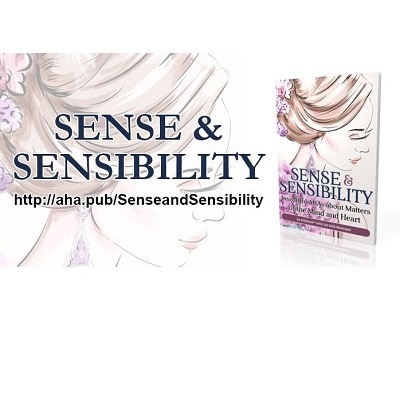 Please share this URL "aha.pub/SenseandSensibility" in your social media status update to let your friends know about it. Sense and Sensibility is a classical literary piece that is etched in many readers' hearts. This AHAbook reveals profound insights concerning good judgment and emotional sensitivity, social class, and financial gain, as well as love, marriage, and relationships. From this timeless collection of AHAs, draw out the worthwhile perceptions that you can use in your daily life, whether good or bad, happy or sad. Be sure to share the wonderful AHAmessages contained in this AHAbook with someone dear to you or even someone who is a stranger to your heart! By simply typing and sharing http://aha.pub/SenseandSensibility in your social media accounts, you will show others the path toward a well-balanced life through making wise decisions and enjoying blissful and healthy relationships that will surely last a lifetime! To see and learn how to automatically share AHAmessages from this book, you may check out this video: https://youtu.be/mmjtCkZuKRM. To learn how to automatically share via AHAblaster, please watch: https://youtu.be/ZP_dtMrID9U.